Baths are a great way to soothe the skin and eliminate stress, and having the right scoops for bath salts makes enjoying bath time that much easier. Using a scoop to measure your salts means you won't be using too little or too much in your evening ritual. Bath salts are great for people with sensitive skin because they don't contain all the chemicals, fragrances and artificial colors that traditional bubble baths do. If you're really concerned about what is going into the products you use on your body you can make your own bath salts just with Epsom salt and some essential oils. Bath salts are soothing (think about a foot soak in warm water and Epsom salts) and exfoliating, and are helpful in calming skin ailments, eczema and rashes. Taking a weekly (or even more frequent) bath with bath salts is a great way to unwind, reduce stress and help your skin. What could be better? 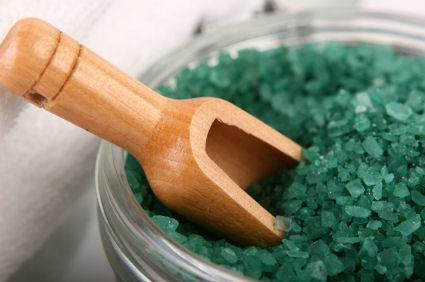 Scoops for bath salts are helpful because they can be used to break up the salt (which tends to get a little cakey as it absorbs moisture while being stored in the bathroom) as well as portion out the right amount for your bath. Scoops most commonly come in wood or metal, and the choice is really up to your personal preference. If you have a very modern bathroom you might want to choose a metal scoop, while wooden scoops for bath salts are appropriate for a traditional bathroom or one with a country feel. The good news is bath salt scoops are widely available and can even be purchased along with the bath salts for added convenience, as with the bath salts at Herbal Garden. Le Melange has wooden scoops that hold a teaspoon, half a tablespoon and a tablespoon, as well as decorative shells that could be used as scoops (perfect for a bathroom with a beachy theme). The Chemistry Store has one tablespoon wooden scoops that can be purchased in singles, 10 scoops or 100 scoops. They also sell jars for holding bath salts. Mabel White sells plastic scoops for bath salts, which hold half an ounce and can be purchased in bulk. The right scoop for you will depend on how much of the bath salts you need to put into each bath. A tablespoon measure is usually appropriate for most bath salt preparations, since one or two tablespoons of salt are usually sufficient to add to your bath. Once you have a scoop in hand, use it to fill your baths and your salts will last longer because you're not touching them, potentially adding bacteria to the mix that will happily grow in the warm, damp environment of your bathroom. Bath salts are a great way to unwind after a busy day. Many bath salt products include aromatherapy aspects through the use of essential oils, which will further allow you to relax and unwind. If you make your own bath salts you have an even better opportunity to add therapeutic fragrances and oils to your salts. For instance if you have body acne you might add a few drops of tea tree oil, which is an antiseptic and helps heal fungus as well as acne. If you need to relax you can throw in a few drops of lavender, chamomile, cedar, jasmine, rosemary or sage to help your mind and body relax in the warm waters. Some people take a bath every day, while others choose to make bath time a special occasion or a reward after a tough day or finally finishing a project. Whichever way you bathe, consider incorporating bath salts into your routine. Your skin will thank you.